Everytime we go eat at PF Chang or some other Chinese Restaurant…we usually order the chicken lettuce wrap if its on the MENU. This meal is a great way to add VEGGIES to your kids meal. My kids LOVE it!!! When I make this recipe…I always buy whole chicken breast and ground the chicken up myself. 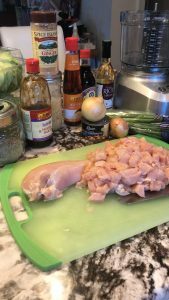 This week at my local grocery store they had a sale on BONELESS chicken breast so during my weekly meal planning….I wanted to incorporate at least 3 meals using these BONELESS chicken breast. I got 6 small trays and so far I have made…chicken marsala and today I used it to make my chicken lettuce wrap.I will use the other chicken breast to make SHREDDED chicken for the kids lunches ….to make CHICKEN enchilada. I made a BIG batch tonight because I wanted to use it in OUR lunch tomorrow. I will use the chicken in mine and hubby GARDEN SALAD while the kids will have it with the BUTTER lettuce leaves. I will pack the lettuce in a ziploc bag for them and the chicken in their thermos. So, all they have to do during lunch is take out a BUTTER lettuce and spoon in the chicken. The chicken lettuce wrap holds VERY well…in the thermos also. 2 (8oz) can water chestnut, drained and roughly chopped. 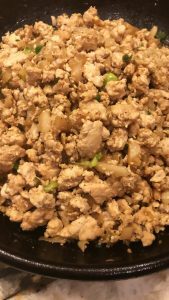 Place the ground chicken in a large bowl and add the sesame oil, salt, pepper and garlic powder. Mix well and let it marinate for about 30 minutes in the refrigerator. While the chicken is marinating. Make the sauce. In a small bowl…add the hoisin sauce, soy sauce, rice wine vinegar, ginger and minced garlic. Mix well and set aside. To a large skillet… add the olive oil, marinated ground chicken, and cook over medium-high heat until chicken is cooked through. Taking a spoon and try to break up the ground chicken. Next, add the chopped onion and cook until the onions is translucent. Then pour in your PREPARED sauce and stir really well. Lastly, add the chopped water chestnuts and stir. Taste and SEASON according to taste. You might want to adjust with some more soy sauce, hoisin sauce or pepper. 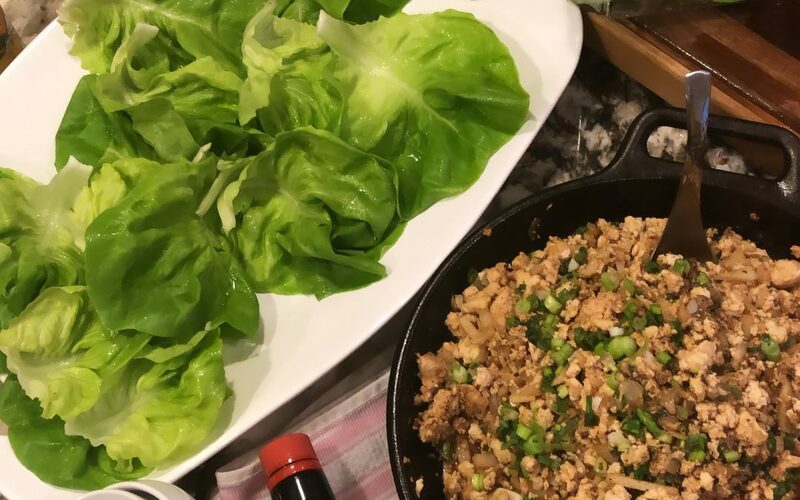 Take the skillet off heat and garnish with sliced green onions. Spoon about 1 heaping TABLESPOON of the mixture into a BUTTER lettuce leaf. ***** You can dip with a soy sauce or Ponzu sauce…. mix either one with some garlic chili sauce. I LOVE mine SPICY. They have RICE WINE VINEGAR and then they have RICE VINEGAR….make sure you get rice WINE vinegar. Can’t wait to try this! I wish I could find lettuce leaves like the ones at PF Chang’s. 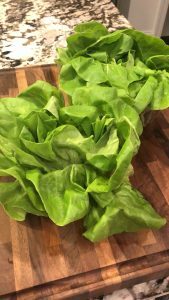 We start off with a few Bibb lettuce leaves and then I always have rice for rice bowls to make it heartier. My new favorite hack is the Uncle Ben’s 90 Second Basmati rice packets. 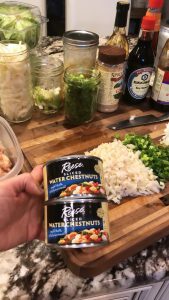 I’ve never made instant rice but these are just so good and convenient! The lettuce that they used at my PF Chang is regular iceberg lettuce…I love to eat my chicken lettuce wrap with BUTTER lettuces.